(DW)- Despite Somaliland being a traditionally male-dominated society, it's the women who turn out to vote in larger numbers. What’s up with the men? James Jeffrey reports from the capital Hargeisa. At first glance it looks like a group of Somaliland women are playing a virtual-reality computer game. 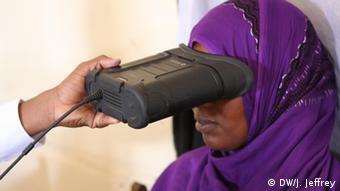 But futuristic-looking headsets held against their eyes are taking iris scans as part of biometric data collection on the last day of voter registration in Somaliland's Maroodi-Jeex region. Free and fair elections carry great importance in any country, but in Somaliland there is additional significance from how another election completed successfully and peacefully can only help its case for international recognition of its sovereignty. With so much at stake, you might expect a huge turnout for voter registration. But that's not quite the case, especially among men. In fact, most Somalilanders who register and vote are women. "I'm expecting some good will come out of the elections that will help the development of the country and improve job opportunities, as there are so many unemployed here," said 28-year-old Nuura Dahir. 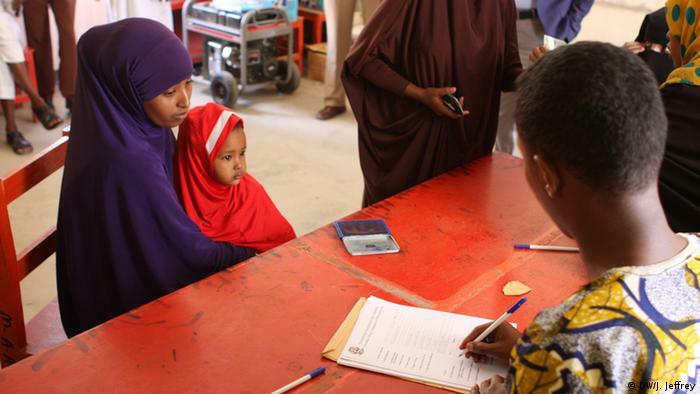 With her baby strapped to her side, in a school being used as a voter registration centre in a northern suburb of Hargeisa, Somaliland's capital, Dahir said that the country is "facing many challenges." Maroodi-Jeex is the fourth region to complete voter registration, leaving two more. After breaking for Ramadan during June, registration will re-start on July 15 in the Sanaag region, followed by the Sool region, which should be completed by mid-September, according to Somaliland's National Electoral Commission (NEC). It's expected that about 30 to 35 percent of Somaliland's roughly four million people will register. "Our people are nomadic, moving from one place to another and so we can't get the whole population," said Abdikadir Iman, NEC's chairman. "We don't have permanent addresses always like in Europe, and after grazing sometimes they cross the border with Ethiopia." "Women in Somaliland are more hardworking than men, they are more patient than men, and they are more eager to participate in the development of the country as well," said Abdikadir Iman. "Men, they are lazy, and they are always chewing this drug [khat], so they don't care whether they go [register] or not." Iman did acknowledge that higher female turnout is influenced by simple demographics, although hard to verify. It's estimated that about 60 percent, and maybe even higher, of Somaliland's population is female. A long history of wars - tribal, civil and regional with the likes of Ethiopia - has taken its toll on men in Somaliland. And despite now living in more peaceful times, the majority of Somalilanders undergoingtahriib, migration to the likes of Europe, are male. At the same time, some men in Somaliland are unwilling to participate in elections. "I don't go and vote because I'm not happy with the quality of candidates who have no agenda and just want to earn a living," said a Hargeisa male resident in his thirties. "In the West, every party has an agenda, but here no one is running because of vision and quality - no one is elected on merit." 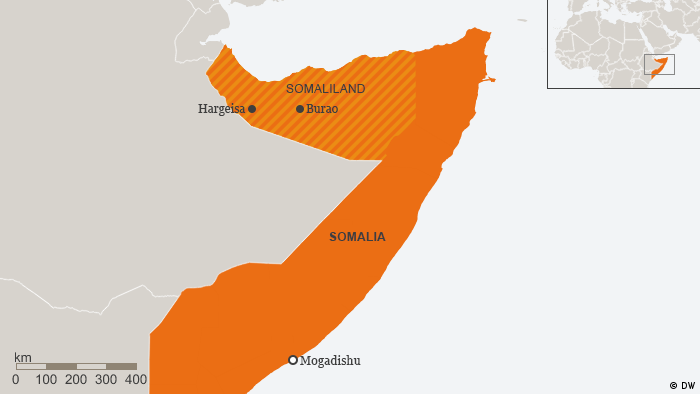 Somaliland's drawn out quest for statehood has taken a toll, too, on voters' attitudes. "Some men don't consider [registration] an important issue, as they say we have been democratic for 25 years but that has not produced any results, so there are no benefits to elections," said 34-year-old business man Abdirizak Ahmed. "Other countries that are not democratic are supported by the international community, whereas Somaliland has got nowhere. So some people have lost interest in the electoral process," he added. Somaliland's political system is young and, like many systems in a country that has to get by in international isolation, unorthodox. During Somaliland's first decade of independence after it broke from Somalia in 1991, political parties were prohibited while the country focused on reconstruction from its shattered remnants. The transition to a multi-party system headed by a president only occurred in 2002. A hybrid parliamentary system blending old and new was established, comprising two houses of 82 members each. The unelected House of Elders (known as the Guurti) is a council of traditional elders. Members of the more conventional House of Representatives are elected for five-year terms, and will be up for contention in 2017. The Guurti is credited with playing a major role in maintaining Somaliland's peace and steering the self-declared republic away from the fate of south-central Somalia. But of late, there have been increasing concerns about potential negative repercussions from mixing the clan system and politics. Another source of concern is how six-year term limits for the Guurti have failed to be enforced. "By maintaining the divisive issue of clan identity at the forefront of public discussions, Somaliland is holding back its political evolution and social integration," said Rakiya Omaar, a lawyer and Chair of Horizon Institute, a consultancy firm that works on strengthening the capacity and self-reliance of institutions in Somaliland. Despite ongoing frictions in the body politic, some argue Somaliland's series of democratic elections held since 2002, resulting in orderly transfers of power, illustrate a political maturity beyond other African countries that have enjoyed independence for 50 years or more. "For me an election has a very big meaning," said 70-year-old Abdi Mohamud, using his walking stick to navigate voter registration in downtown Hargeisa. "If there is no government then there would be chaos. I have voted in every election because I have the right to select the leadership of the country." 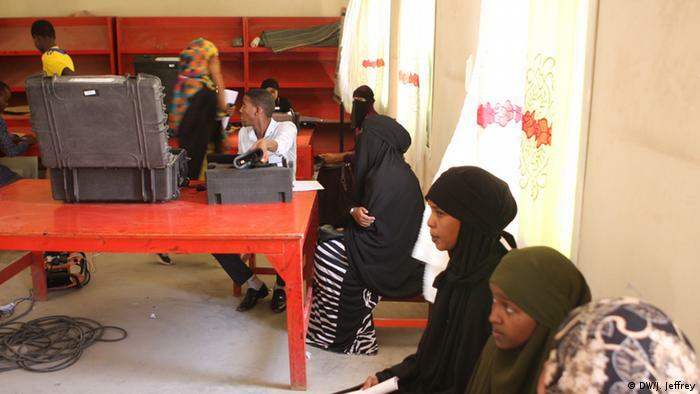 "It's important for the youth to participate in these elections as they are the majority of the population," said 21-year-old Naima, alluding to the fact that about 70 percent of Somaliland's population is under 30 years old. "We've got the responsibility to elect the right leadership for this country to take it forward." Progressing through the registration process at a station in the center of Hargeisa, after the iris scan Naima lifted her niqab face veil to have her photo taken. The technology and equipment looks impressive, appearing to testify to how seriously Somaliland is taking this election. But there may be a downside. "The turnout has not been as good as last time," said Abdikadir Khadar, an observer for the Wadani Party at the same registration station. "There have been several previous registrations in the past and that may have confused people, who thought they could still use previous voter cards. And some people are discouraged by constant changes, and having to keep registering." Once voter registration is completed in Somaliland's six regions there will still be much for NEC to do: verifying voter lists, dispensing voter cards. But according to Abdikadir Iman, everything is on track for the national elections on March 27, 2017. "When it comes to democratization in Somaliland it touches your feelings, as people come to register voluntarily, and they keep order all by themselves and cue up," Iman said. "That's the beauty of it, and when you see it, you are reminded of what you see in the West - here they are also mature about democracy," he added.